When it comes to grilling, I tend to fall into cycles. There's the red meat month, the I-didn’t know-you could-grill-that month, and quite often, the fish month. It looks like I'm in the fish month. I gravitate towards grilling fish because it is fast and easy. If you thought I was going to mention "healthy", you know that typically isn't one of my decision points! I find some people get freaked out by grilling fish for a number of reasons, but most often because of issues with the flesh sticking to the grill grates. To compensate, some (READ: My Dad), deploy an elaborate system of grill/wire/rack/basket systems to avoid having fish apocalypse on the grill surface. I reject these grill apparatus and use what nature intended to keep my grill grates clean, a whole fish's oily skin. My go-to whole fish to grill is Rainbow Trout. I say "go-to" as it is what I can dependably find at my local fishmonger. No matter what species you chose, fresh is always best! Prep the grill for direct medium heat. Prep the fish. The first order of business is to get rid of the fins. With a pair of scissors cut off all of the fins, but leave the tail and of course, the head. 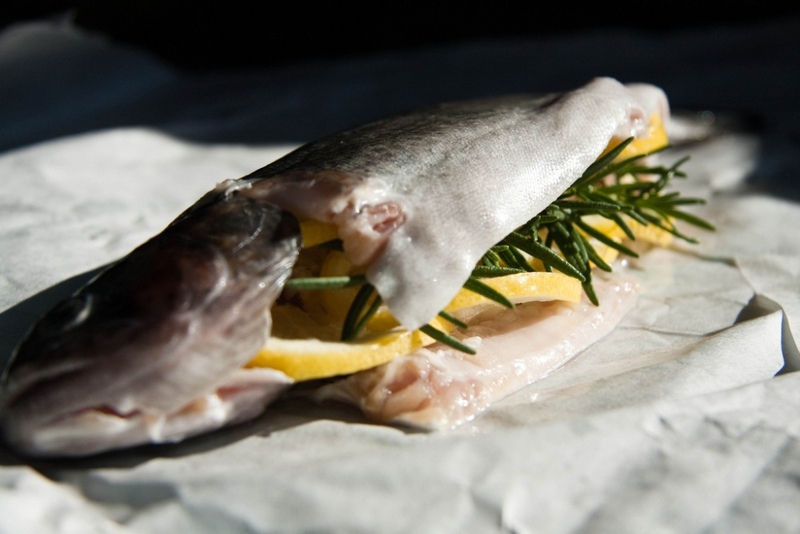 In the cavity of the trout, drizzle some olive oil, and stuff with the lemon wedges and rosemary. Then, brush the skin of the fish with additional olive oil. With the fish dressed, throw some hickory chunks on the hot coals. This will be a fast cook, so there is no reason to soak the chunks ahead of time, just drop them in. Once the chunks start to burn, it's time to grill. Grilling a whole fish is a lot easier than grilling a skinless filet. The key to not leaving half of your dinner on the grates is to oil them...well. Typically, I say either oil the grates, or your food. When grilling fish, I say oil both. Place the fish directly over the coals. For a one pound fish, grill for approximately 15 minutes, flipping the fish over every 5 minutes or so. Doing so provides even cooking to both sides. The fish is done when the flesh begins to flake. Don't worry, you can see the flesh peaking out from under the skin. Also, when you push down on the skin, the cooked flesh should feel squishy. 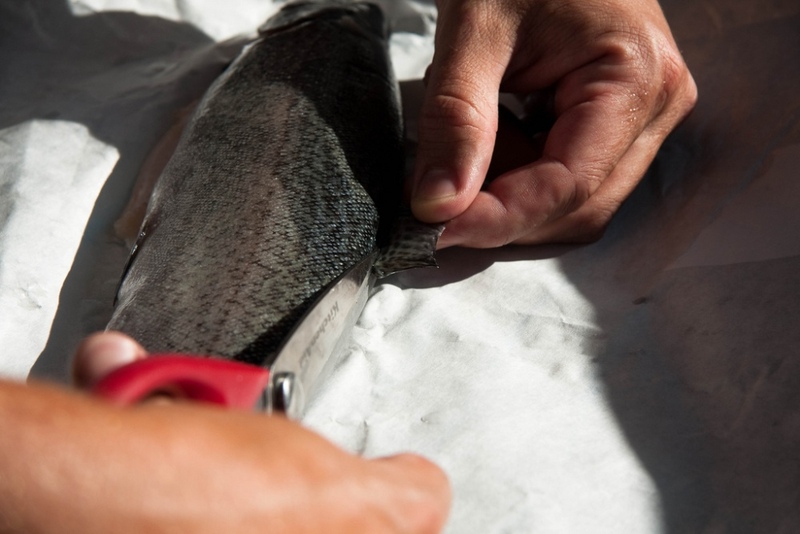 Once the fish is done, move to a cutting board. Remove the flesh from the carcass, and for a special treat, set the skin aside. Grilled fish was never so easy, and never so good.